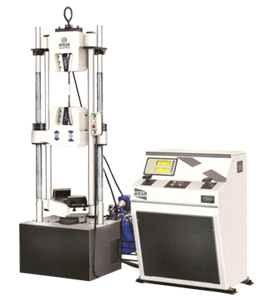 Printer & PC graphs enable study the behavior of the materials. 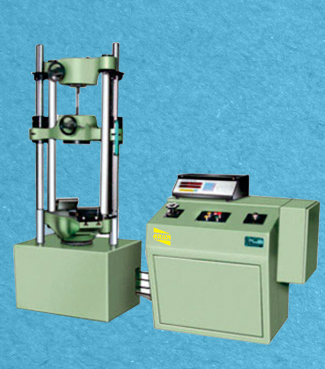 Motor driven threaded columns for quick effortless adjustment of middle crosshead to facilitate rapid fixing of test specimen. RS 232 serial port to transfer data to computer for analysis/storage evaluation etc. Manual control & release valve operation. 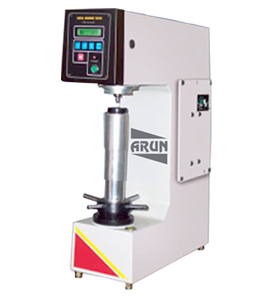 ARUN Electronic Universal Testing Machine is designed for testing metals and other materials under Tension, compression bending, transverse and shear loads. 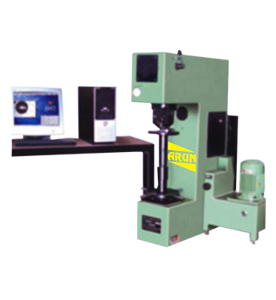 Hardness test on metals can also conduct. 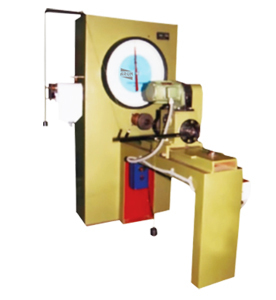 Load is applied by a hydrostatically lubricated ram. 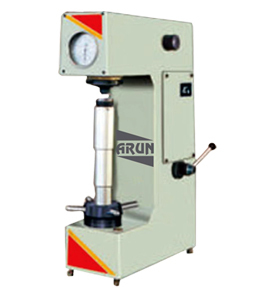 Main cylinder pressure is transmitted to the pressure Transducer housed in the control panel. 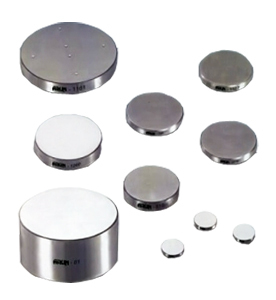 The transducer gives the signal to the electronic display unit Corresponding to the load exerted by the main ram. 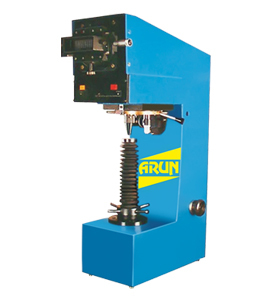 Simultaneously the digital electronic fitted on the Straining unit gives the mechanical displacement to the electronic display unit. Both the signals are Processed by the microprocessor and load and displacement is displayed on the digital readouts Simultaneously. 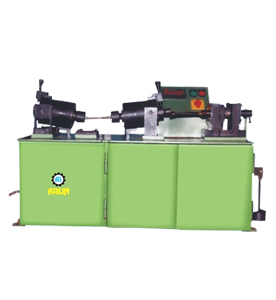 This consists of a cylinder motor with chain and sprocket drive and a table coupled with the ram of the hydraulic cylinder, mounted on to a robust base. 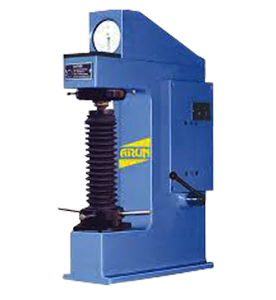 The cylinder and the ram are individually lapped to eliminate friction. The upper crosshead is rigidly fixed to the table by two strengthened columns. The lower crosshead is connected to two screwed columns which are driven by a motor. 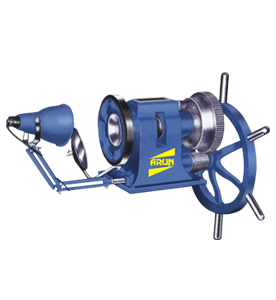 Axial loading of the ram is ensured by relieving the cylinder and ram of any possible side loading by the provision of ball Seating. 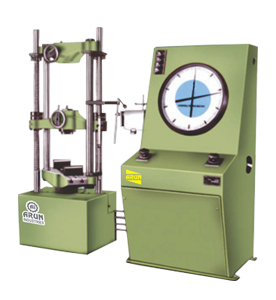 An displacement scale with a minimum graduation of 1mm, is provided to measure the deformation of the Specimen. 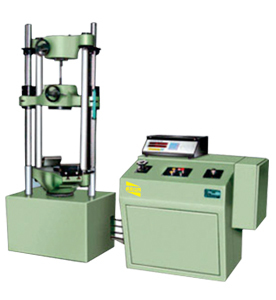 Tension test is conducted by gripping the test specimen between the upper and lower cross-heads and the Table. 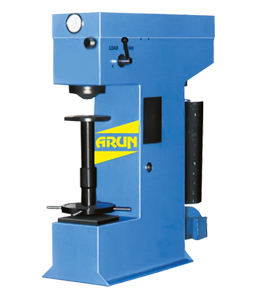 The lower cross-head can be raised or lowered rapidly by operating the screwed columns, thus facilitating ease of fixing of the test specimen. 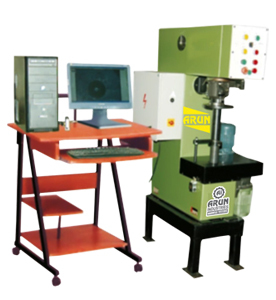 Data entry with numeric keyboard of test parameters including speeds, rupture % peak, preload, modulus data, test data & specimen data etc. RS 232C serial port, Optional windows based software available for. Printer port for printer interface with. The UNIVERSAL 2001 - UTE series control panel can be hooked to any PC using RS-232 communication port. 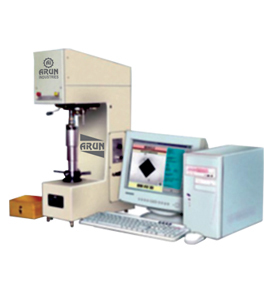 ARUN offers different exhaustive application, Window based software packages with real time graph on PC to enable the user to effectively evaluated different parameters. Statistical evaluation includes with water fall dig. Mean deviation, frequency distribution, Skew dig., Histogram. Also calculates max. value, min. value, Mean value, Variance, Standard Deviation. (Other statistical parameters on request). Selectable batch & statistical printouts. 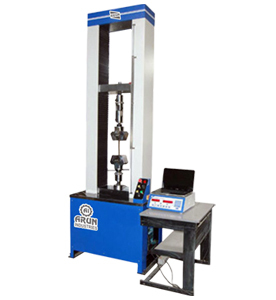 Evaluation of wide range of user selectable parameters such as % elongation, % reduction in area, young’s modulus, yield stress, proof stress etc. 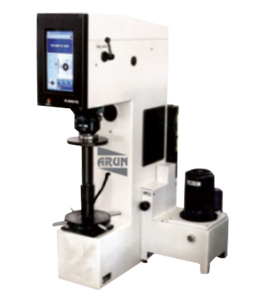 All ARUN Electronic Universal Testing Machines are closely controlled for sensitivity, accuracy and Calibration during every stage of manufacture. 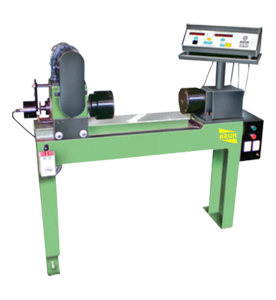 Every machine is then calibrated over each of its measuring Ranges in accordance with the procedure laid down in British standards. 1610: Part1: 1992 and IS: 1828: Part1: 1991. 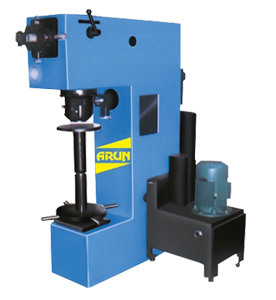 ARUN Electronic Universal Testing Machine comply with Grade "A" of BS : 1610 : Part1 : 1992 and class 1 of IS-1828-Part-1:1991. 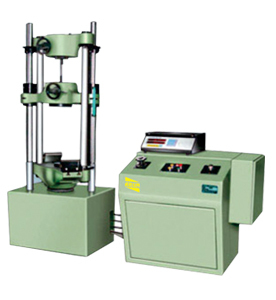 An accuracy of +1% is guaranteed from 2% to 100% of the capacity of the machine. 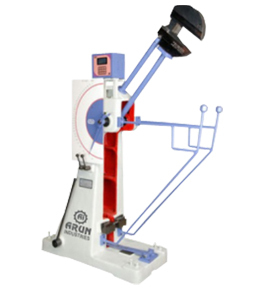 Below 20% of the selected range, the maximum permissible error is 0.2% of the full load reading.